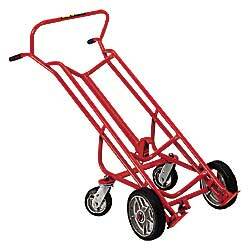 Safely load and unload drums onto or off pallets with this handy drum truck. Load rests on 4 wheels reducing operator fatiguetruck rolls without operator support. Kick stand allows unit to stand alone. 25"W x 61"H units support 1,000 lbs. 16-1/4"W at nose. All wheels have grease fittings. IN STOCK. XP-434 Wt. 79 lbs. Mold-on rubber 10" & 6" rigid wheels. XP-435 Wt. 61 lbs. Polyolefin 10" & 6" rigid wheels. XP-436 Wt. 83 lbs. Mold-on rubber 10" rigid & 6" swivel casters. Not recommended for loading and unloading drums from pallets.